Ocado's revenue grew by 11.2% in the 13 weeks to 13 March compared with the same period last year, although the online food retailer's income was hit by a fire in its warehouse in February. It will start in September 2020 at the latest, once Ocado's current deal with Waitrose has expired. 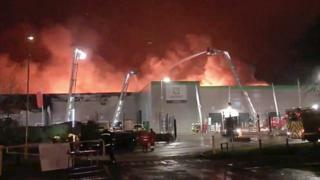 More than 30,000 orders - 10% of Ocado's capacity - were processed at the Andover warehouse, which was on fire for four days. Chief executive Tim Steiner said: "The fire has been a setback, but it will only be a temporary one. "Our teams have been working hard to minimise any disruption to our customers and we will build a state-of-the-art replacement facility that reflects all the innovations and improvements we have made since Andover opened in November 2016." Mr Steiner said that with the Marks & Spencer deal, he felt that "Ocado Retail has never been in a stronger position". He added: "We are looking forward to the future with excitement and determination." Sophie Lund-Yates, equity analyst at Hargreaves Lansdown, said: "Today's announcement leaves no doubt Ocado has its eyes firmly on the future, with the group letting investors know last month's warehouse fire will be nothing more than a temporary setback. "The first quarter has gone about as well as can be expected and it's looking more and more like Ocado will make it over this bump in the road."